Monarchic governments are headed by a king or queen, or an emperor or an empress. They are part of the royal family and pass out their responsibilities to their offspring. They also have absolute control over the countries they rule. There are several types of monarchic governments, each differing from each other. I want to take a look at a few of those that are written up here on the board, first being absolute monarchy. This is when someone has complete control over the country they rule and pass off the responsibility to their offspring. A constitutional monarchy is when the person in charge does not have complete control over the country. Instead, a constitution has been put in place, which limits the powers of the king or queen, or emperor or empress. However, they still do pass off their powers to their offspring. A diarchy is when you always have two monarchs in control at the same time. An elective monarchy is when someone is elected to the role of king or queen, or emperor or empress, instead of being passed on through the family. 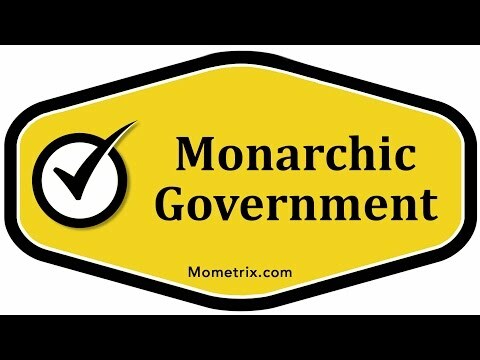 A federal monarchy is when states with their own forms of government are banded together under one, single monarch. Those are several forms of monarchic governments.